The fixed table x$ksmmem (Kernel Layer, Service Layer, Memory Management, MEMory) is basically a memory map of your SGA. It contains a row for each memory address (addr) and the value stored at this location (ksmmmval). This post shows which areas were accessible over this structure in older versions of Oracle, and more importantly, which areas are not present anymore in more recent versions. In all examples ASMM is enabled, AMM disabled and platform is Linux x86_64. Let’s first have a look at the shared memory segments allocated by Oracle. As we can see, there are 3 different segments allocated (Shmid 32768, 65537 and 98306). By taking the values from Actual Addr as the start address and Actual Addr + Total size as the end address, we can write a simple query to see which areas are externalized in x$ksmmem. As can be seen, all SGA areas except skgm overhead can be accessed over this table. Let’s do the same thing in 18.3. Instead of listing the shared memory segments via oradebug ipc we can query the new fixed table x$ksmssinfo (Probably a mnemonic for (Kernel Layer, Service Layer, Memory Management, Shared Memory Segment INFO). We execute the same query as before, with only the start and end addresses changed. As can be seen, in Oracle 18.3 only the Fixed Size area is externalized in x$ksmmem. In fact, this is the case since bug 19363432 (introduced in 12.1) has been fixed later in Oracle 12.1. The behavior in Oracle 12.1 before applying the bugfix, is that x$ksmmem also displays addresses which are not currently mapped. This leads to segmentation faults when you try to access this memory location by referring to x$ksmmem.ksmmmval. Unfortunately, after applying the bugfix, all areas except Fixed Size disappear from this fixed table. In some cases, you want to have access to the contents of shared memory for troubleshooting. x$ksmmem provided a convenient way to do so, because you could use it in any query (e.g. by joining to other fixed views/tables containing memory addresses). Of course, you can still use oradebug peek or any other tool you like, but it’s definitely more cumbersome. I recently faced a strange issue where a user got an ORA-01950: no privileges on tablespace while issuing some DML statement. A quick look on DBA_TS_QUOTAS showed that the segment owner (according to DBA_SEGMENTS) has unlimited quota on the reported tablespace. After checking the view definition of DBA_SEGMENTS and its backing view SYS_DBA_SEGS I became a bit suspicious because the reported owner is taken from SYS.OBJ$. Could it be, that the segment is in fact owned by a different user? Bingo! Querying SYS.SEG$ revealed that the owner of the segment (USER#) is indeed a different one than the one reported by DBA_SEGMENTS. In fact, the user did not even exist anymore. The query returned 2 rows. Both segments were non-partitioned primary key indexes on a partitioned table. Rebuilding the indexes fixed the issue but I’m still curious how this could happen. The user# in seg$ is not swapped after a partition exchange when the tables involved are in different schemas and one of the segments (partition/ subpartition/lob fragment) is delayed, then it is likely that you have hit this bug. Despite that in my case no exchange partition was performed, deferred segment creation is certainly enabled. So, I assume it has something to do with that, but I was not able to think of a scenario where this could happen, nor was I able to create a reproducible test case. It should be clear that a SQL Plan Baseline becomes non-reproducible if you change the underlying objects in a way that prevents the optimizer from using the given execution plan (e.g. by dropping an index used in the execution plan). In such a situation the plan baseline will be marked as non-reproducible. A change in the optimizer environment can also be the reason for the optimizer not being able to reproduce a baseline. SQL Plan Baselines store a set of hints that should guide the optimizer to use the desired plan. But in some situations, not all the required hints to reproduce the exact same plan are stored in the baseline. This blog post explores these situations and gives some tips to avoid them. It also shows how such non-reproducible baselines can be made reproducible with the use of SQL Patch. Especially note the FILTER operation on plan line id 1. We create a baseline for this statement. When we execute the query again, we see a note at the end of the execution plan telling us that the created baseline was used. The generated plan with help from the hints from the baseline produced a slightly different plan (no FILTER operation anymore). This shows that the hints stored in this particular baseline are not sufficient to generate the exact same execution plan. Instead, Oracle will now use the generated plan with the lowest cost. In this example the used plan is not much worse than the one stored in the baseline, but the key point is that the baseline was not used. In real scenarios this could mean that a possibly much worse plan is used. Parallel hints (e.g. PARALLEL or NO_PARALLEL) when influenced by session level settings, by executing alter session force parallel query for example. So, if the optimizer environment of the session executing the statement differs from the environment where the execution plan of the baseline was generated, there’s a potential for non-reproducible plans. This is only true if there is no regular hint leading to the same execution plan. If, for example, an execution plan is doing an index join, the SQL Plan Baseline would store the hint INDEX_JOIN. Disabling index joins on session level (alter session set "_index_join_enabled" = false) has therefore no impact on the reproducibility of the baseline. When loading an execution plan into a SQL Plan baseline always keep in mind what optimizer environment was used to generate the plan and what optimizer environment is used by the session supposed to benefit from the SQL Plan Baseline. Note that in our scenario we used the default optimizer environment to generate an execution plan to be used in the SQL Plan Baseline and an altered optimizer environment to show that the baseline is not used. It could also be the other way around, whereas we would not find any information about altered parameters in the trace file. Packing the SQL Plan Baseline into a staging table (DBMS_SPM.PACK_STGTAB_BASELINE), modify the hints stored in the OTHER_XML column and unpack it again. We see, that the created patch and the baseline are now used again. I’m two-minded about the fact, that not all necessary hints are stored in the SQL Plan Baseline. In case of the parallel hints it would have been easy for Oracle to add them to the baseline when necessary, but it was probably decided to intentionally not do that. If you force parallelism on the session for example, you probably don’t want to use a baseline with a serial plan. Regarding the optimizer parameters I think a changed parameter should not be a reason for a baseline not being used. In Oracle JDBC version 11.2 LOB prefetching was introduced. The whole point of LOB prefetching is to reduce the number of roundtrips needed to get the LOB data. The goal of this post is to show how LOB prefetching works and point out which variables influence the optimal prefetch value. With JDBC driver versions older than 11.2 the behaviour when fetching LOB data is as follows: The client fetches the amount of rows, depending on the set fetch size. If the rows include a LOB column, the client is provided with a LOB locator, which is basically a pointer to the LOB in the database. There is no actual LOB data sent to the client at this point. At the point where the LOB is accessed, e.g. by calling ResultSet.getClob, the client requests the LOB metadata from the database (like LOB length and chunk size). Then in a second step, the LOB data is requested from the database. So, for every row 2 additional roundtrips are necessary to get the LOB data. Since JDBC version 11.2 LOB prefetching is available, which can minimize the number of roundtrips. It can be set on the DataSource, Connection, Statement or even on column level by using one of the overloaded methods OracleStatement.defineColumnType. Check the documentation for more information. In JDBC version 11.2 the default value for LOB prefetching is -1 which disables LOB prefetching. Since 12.1 the default is 4000. By setting LOB prefetching to 0, you enable metadata prefetching. For every LOB column, the metadata is already fetched with the rest of the row data. This avoids one extra roundtrip for each row when accessing the LOB, as described earlier. Any value higher than 0, sets the amount of LOB data to be prefetched for each LOB. For CLOB data it defines how many characters, for BLOB data how many bytes that are prefetched. So for each LOB smaller than the set prefetch size, no additional round trip to the database is necessary. All tests are done with Oracle JDBC 18.3 and Oracle Database 18.3. I’m not aware of any changes to how LOB prefetch work since version 11.2, but memory management has changed in the 12c driver, so it’s probably worth to execute the benchmark on your own if you use driver version 11.2. The benchmark itself is done with JMH. The test class can be seen here, but here’s a wrap-up what’s going on there. Fetch 1000 rows in total. For every row, access all the data stored in the LOB column. Fetch size: 10, 100, 1000. LOB Prefetch: -1 (disabled), 0 (metadata), 2000 (half of the LOB), 4000 (whole LOB). Network latency: ~0.5ms, ~1.5ms. See this blog post on how to simulate network latency on Linux. Let’s first have a look at the number of roundtrips needed. The chart simply shows how many times the database waited for SQL*Net message from client. The number of roundtrips is cut in half by using metadata prefetching. Prefetching just part of the LOB data, results in the same number of roundtrips as when we just prefetch the metadata. This is because in this benchmark the rest of the LOB is always fetched later on. 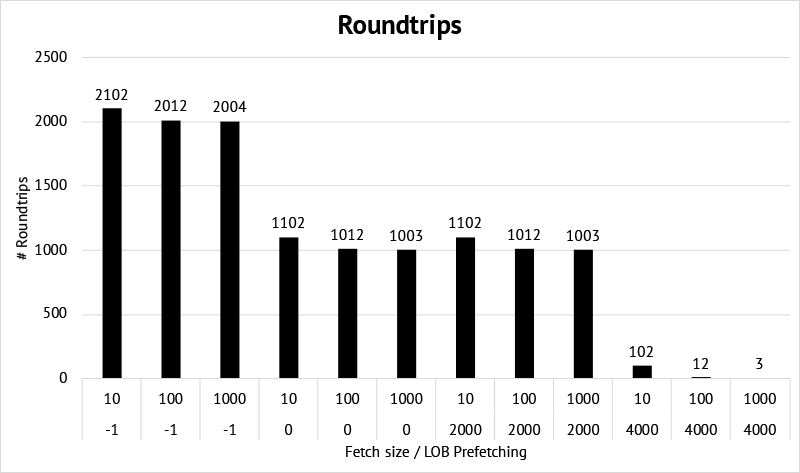 By prefetching all the LOB data, the number of roundtrips is greatly reduced and mainly driven by the row fetch size. We saw the impact the different scenarios have on the number of roundtrips. The following chart shows the average runtime out of 10 runs for the various scenarios. The benchmark was performed with 2 different average network latencies (~0.5ms and ~1.5ms). Note that the runtime was obfuscated and does not correspond to a real unit of time. The lowest runtime is set to 1, and the others are aligned accordingly. The higher the latency, the bigger the impact of reducing the roundtrips by prefetching the LOBs. Prefetching only a part of the LOB, and access the rest later is slower than only prefetching the LOB metadata. I tested it also by fetching BLOB instead of CLOB data and access it with ResultSet.getBytes. I suspect that’s because of some implementation detail in the JDBC driver and something that could change in the future. LOB Prefetch: -1 (disabled), 0 (metadata), 8000 (part of the LOB), 10485760 (whole LOB). Here’s the result: Note that the runtime was obfuscated and does not correspond to a real unit of time. Metadata prefetching or prefetching just part of the LOB data, does not show any runtime improvements in this case. Even though the improvement of fetching the whole LOB is not as big as with 4K LOB size, it’s still ~65% faster. Bigger LOBs (and same network latency) will further diminish the relative performance improvement. 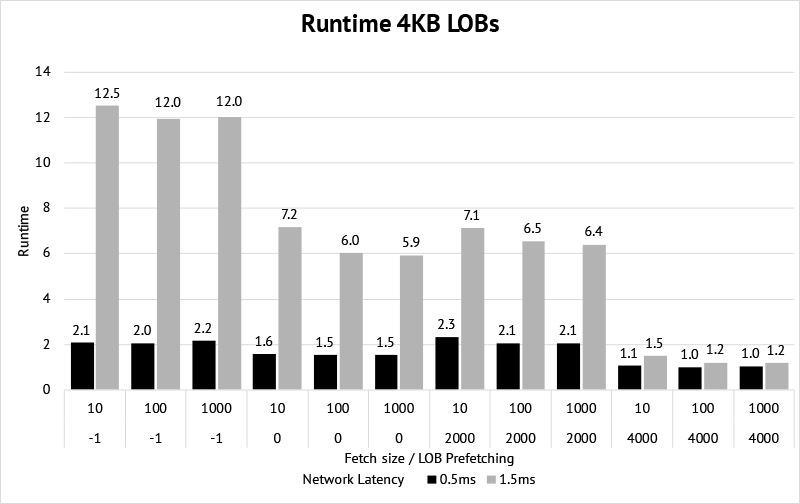 I didn’t do any measurements on client-side memory consumption but you should be aware that row fetch size and lob prefetch size affect memory consumption. 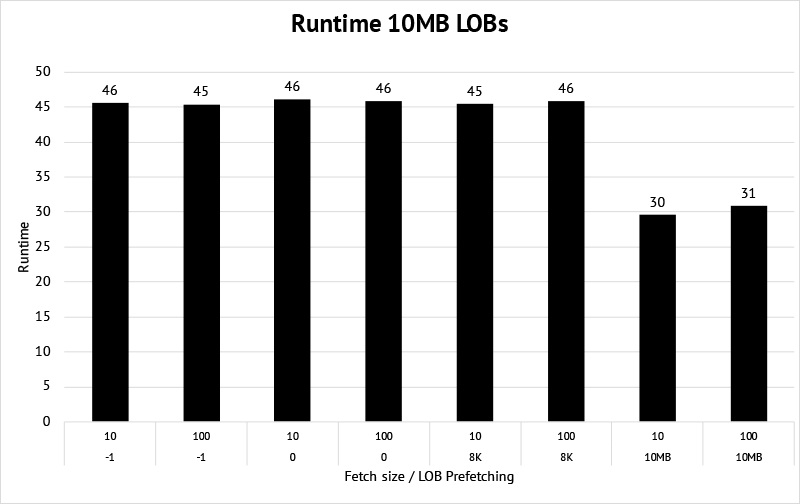 If you for example, set LOB prefetch size to 4000 and row fetch size to 1000, the driver needs at least 10 times more memory than setting the fetch size to 100. With high network latency and small LOBs, the benefit of LOB prefetching will be most noticeable. The larger the LOBs get or the lower the network latency is, the less overall time is spent for the roundtrips and the benefit will be less significant. Setting the optimal value for LOB prefetching depends on your LOB size (or to be more precise, the amount of LOB data that is accessed), the fraction of LOBs that are really accessed (e.g. only every 10th LOB in your result set is accessed), network latency, and last but not least on your memory constraints. As many factors come into play when setting the optimal value, you have to test it under real conditions in your environment. If you want to run test cases that are sensitive to network latency, it’s important to also test them under the effect of different latencies. For example you want to know what it means if you move an application currently running on the same server as the database to a different server. Or you are doing some small tests locally on your computer and want to know how they would behave in a real environment where client and server are on different machines, maybe even with long geographical distances between them. I usually use the method described here when I want to run some tests on my laptop where I have an Oracle Database running in a Virtualbox VM. Linux provides a kernel module called NetEm (Network Emulator). With NetEm you can add a delay to all packages leaving (outgoing) a certain network interface. You can do a lot more things with NetEm like duplicating, corrupting or reordering packages and more. Check the man page or the links at the end of this post to find out more about it. NetEm is an enhancement of the Linux traffic control facilities and can therefore be controlled with tc. I’m just going to ping my virtual machine and add a delay after a couple of pings. Add delay of 10ms on eth1 on my virtual machine. This means the packages leaving eth1 (in this examples the answers to the ping) will be delayed by 10ms. The output of ping clearly shows the effect of adding the delay with tc.